Just because lace is an abiding addition, I had the yarn in the house and the book beside my favorite knitting chair, and I can’t stand to be without something to twiddle, I started another interim project from Duchrow’s Volume III. which the glossary calls out as being a K1 through the back of the loop. But unless you knit both of the stitches previously formed by the double YO together, the stitch count and resulting look/feel of the piece are both flat out wrong. It’s also not a given that the double yarn over is supposed to carry only one knit stitch on the subsequent plain knit row, with that second YO loop being dropped (which would make the single k1tbl logical) because in some but not all spots I need that extra stitch to be eaten into a later k2tog or ssk decrease. So the first repeat on each row has been an exercise in looking at the tiny blurry engraving of what the final product is supposed to be, counting stitches and proofing the repeat chart. Still, the thing is beginning to grow. Here’s the traditional lousy String snapshot of yet another snood-like object wadded up onto needles. In terms of the yarn – what I’m using is pretty thin. It’s 75% cotton, 25% linen marked as 2/30 – thinner than cobweb or Perle Cotton. I’d say it’s the equivalent of two plies of standard embroidery floss. I’m working it on nice, big 2.5mm needles and getting a quite satisfactory light and open texture. I do have a minor concern with ruffling, but unless I stop and put the whole piece on a temporary holder and spread it out, I won’t know how justified that concern might be. 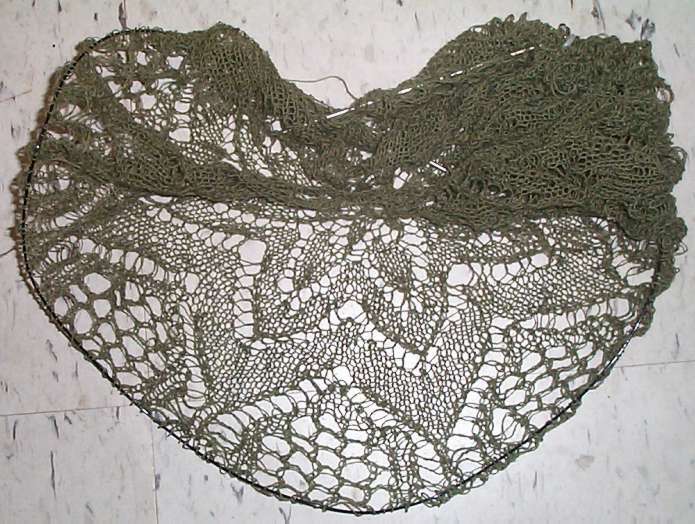 Olive green may be a bit non traditional for lace, but over a navy tablecloth on my kitchen table, underneath white dishes with navy rims, it will look smashing. And once more, copious thanks to Friend Dena the Lace Enabler, who gave me the cone of yarn. Plus, the tea stains won’t show up on the olive green!